Tuna is SO GOOD FOR YOU! It’s on my top 5 foods that won’t break the budget. Really, it’s something that you should regularly stock in your pantry. Healthy living and eating should not have to be overly complicated nor overly expensive, and tuna is one of those ingredients that prove it. Part of the reason it is so good for you is that, in an entire can of tuna there is about 35 grams of protein and only 150 calories! It also provides a good amount of iron, vitamin D, niacin, vitamin B6, and vitamin B12. There are not many foods with that profile! This past week I received a box of Safe Catch tuna – a tuna with 10x lower mercury levels than other tuna, and not only that, but the way it is (or isn’t, rather) processed allows for more of the heart-healthy Omega-3s to stay with the tuna. WOW. 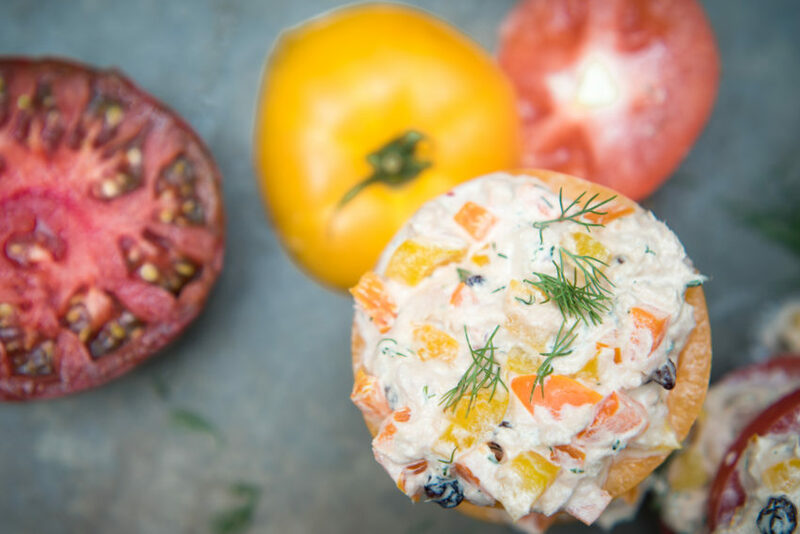 The heirloom tomatoes at the market were begging to be used, and this was just the recipe to use them with! I also had to try them in pure salad format too. 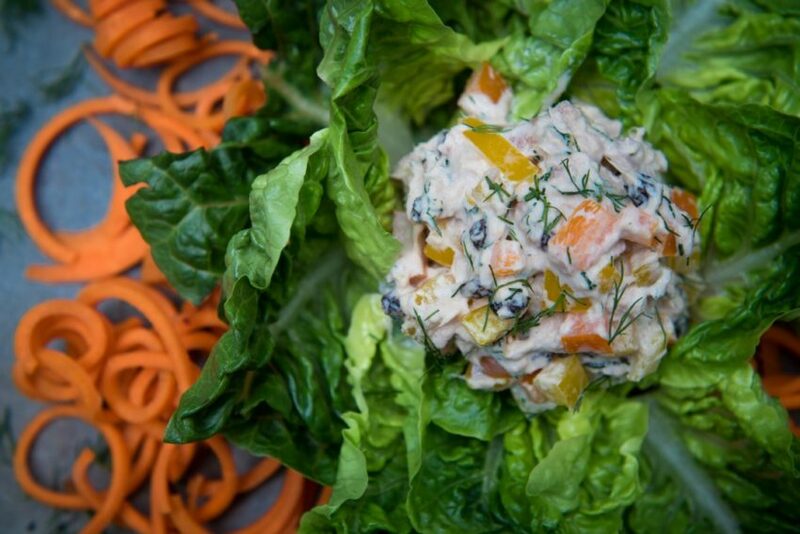 I had recently been experimenting with a handy spiralizer, so Bibb lettuce and spiraled carrots made their appearance…. 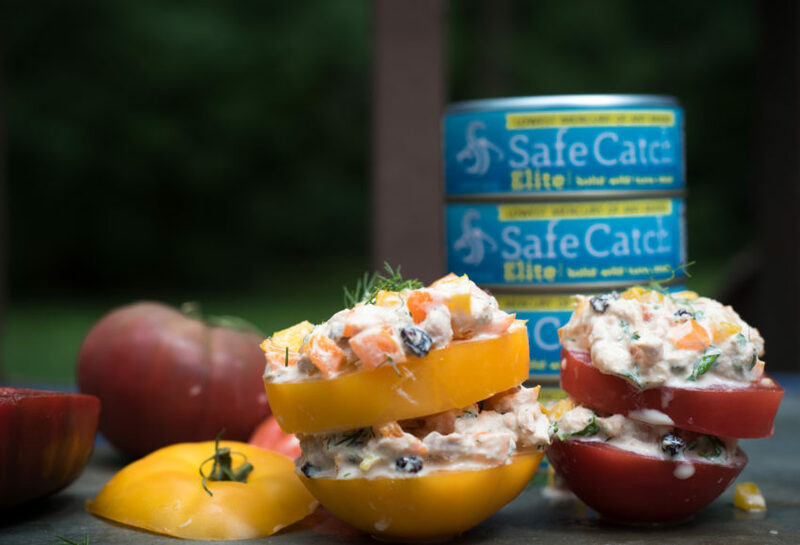 Thank you to Safe Catch for a very fresh tasting, non-GMO and low mercury tuna! Enjoy your week everyone! Eat that protein with garden vegetables! 1. In a medium bowl, mix together all ingredients. (If you are not a fun of the dried currants or can’t find them, feel free to leave them out! I like a sweet bite in my tuna salad, and this combination was SO amazing. But leaving them out would be good too). 2. 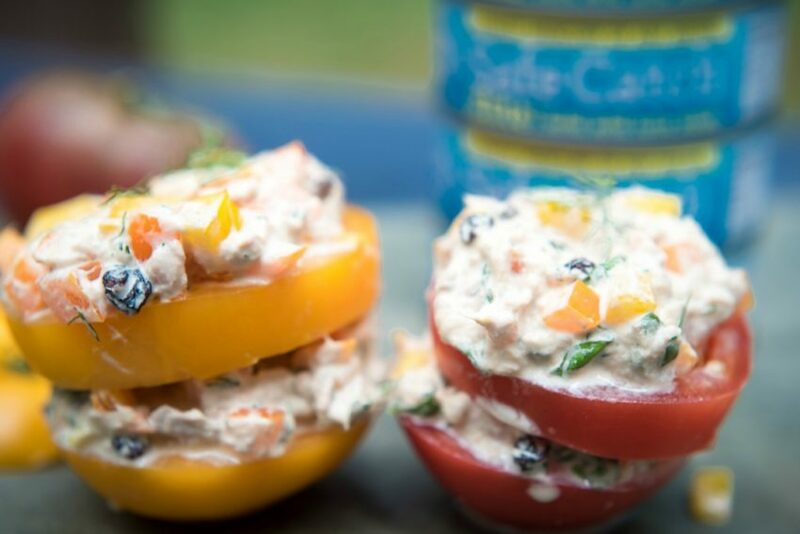 Enjoy tuna scooped onto a fresh garden tomato, or a bed of lettuce. Yum!